Millet flour nei appam recipe with video and step by step pictures. Easy and Instant Nei appam made using millet flour, over riped banana and brown sugar, easy recipe for bachelors and working women. Generally we make nei appam with rice or rice flour or wheat flour. 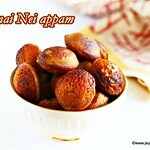 I have posted many varieties of nei appam in Jeyashri's kitchen. We make nei appam for ganesh chaturthi, avani avittam, Karthigai deepam and Krishna jayanthi too. 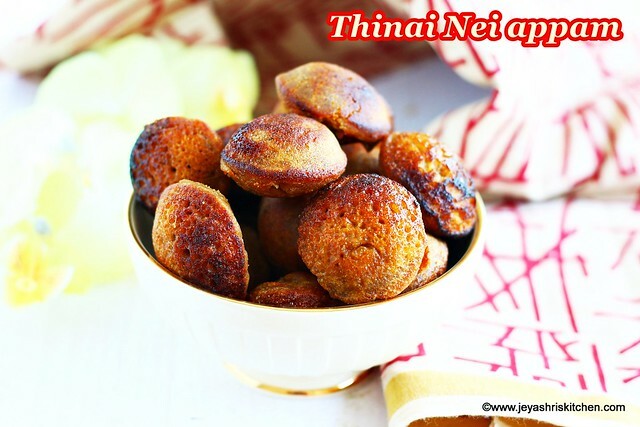 This version of nei appam is with Thinai mavu | foxtail millet flour. I got a pack of thinai maavu to try out some sweet. Among the millet flours, thinai is perfect for making sweets. I have given few sweet recipes using thinai maavu in my Millet cook book. 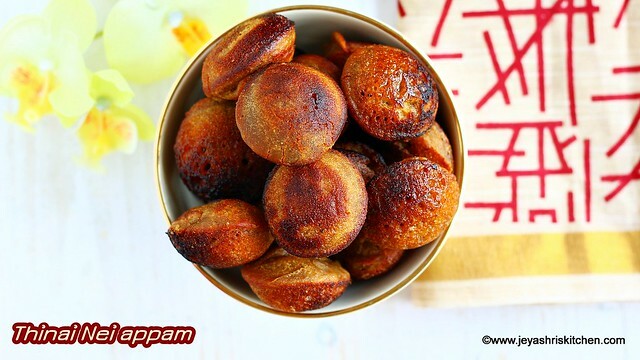 Recently a friend shared with me this recipe of nei appam using brown sugar. It tasted so yum and she made with rice flour. I wanted to try the recipe using the Thinai maavu i got from Sri Murugan stores. We get Thinai maavu in Sri Murugan stores. They have a wide range of millet flours in their outlets. You can place your order through Sri Murugan stores android or iOs app too. Check out their newly opened huge store at Yishun mall. Check to see the full collection of Karthigai Deepam recipes in Jeyashri's Kitchen. Description: Nei appam made using millet flour, over riped banana and brown sugar, easy recipe for bachelors and working women. In a mixie jar add the thinai maavu,wheat flour, rice flour, brown sugar and banana. No need to add any water. The moisture of the banana and brown sugar will do the job. Once done transfer to a bowl. Add 2-3 tblsp of water. Mix well to make a idli batter consistency. Rest this for 1-3 hours. You can start making the appam immediately too. Add coconut, cardamom powder and a pinch of salt. You can add coconut bits instead of grated coconut. Fill the paniyaram pan with generous ghee. Pour in the batter in all the holes. Cook this in a medium low flame. Once it is cooked on one side, flip the appams. If it is not properly cooked while your are flipping it will mess up. Wait patiently and flip the appams. Drizzle some more ghee to this. Once done, take it out. Nei appams are ready for neivedyam. Ensure the batter is not too hard or too watery. Idli batter consistency is perfect. No need to add baking soda to this recipe, as over riped bananas will make it softer. If you do not get thinai maavu in your country, then replace it with rice flour. Thinai Nei appams stayed soft for more than 5 hours.